Whether you're an amateur or professional photographer, videographer or a graphic artist, having a monitor with accurate color and gamma representation is a key component when editing and viewing photos, video, etc. With so many display choices out there today, there's a good chance that pictures displayed on your monitor will look different than when viewed on your laptop or when printing, which is due to manufacturers using different color profile settings from the factory. This can cause some serious headaches, especially when you are in the business of selling and printing your photos. 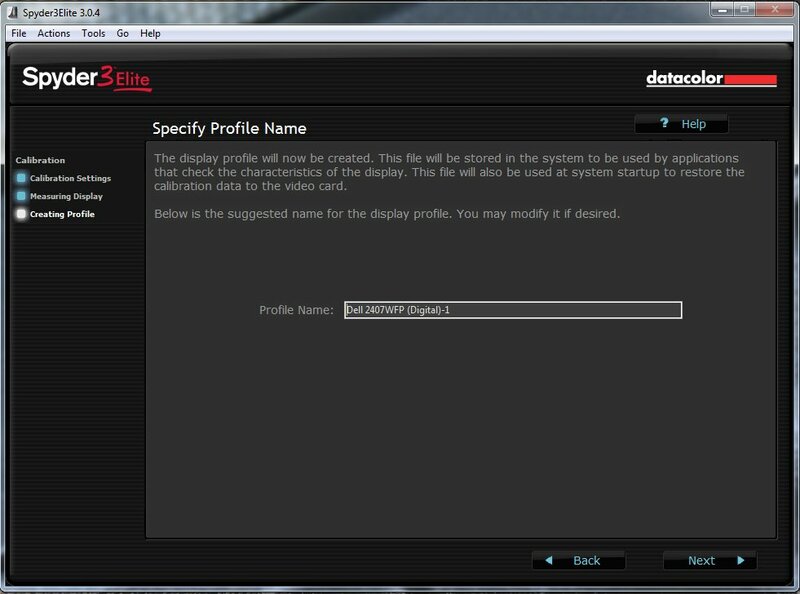 Enter the Sypder3Elite system from Datacolor. The Spyder 3 is their latest display calibration device (aka colorimeter), which they boast is 29% more accurate than previous versions. Datacolor designed the Spyder3 system to help photographers and videographers alike have precise and accurate color and brightness control on all our their displays, whether a LCD screen, laptop, old CRT style monitor, or even a projector. The Spyder3 helps ensure that your images, graphics, and videos will show the same colors, no matter what device you are currently using; this is of course if you've calibrated the display using the Spyder3. Here you can see the Spyder 3Elite retail package. Next we have the Spyder3 colorimeter seated in the included cradle. This unit is approx 37% smaller that its predecessor (the Spyder2), which adds to the appeal of this unit. By being smaller, not only does it take up less room on your desk or on the shelf, but it's also more portable when wanting to bring the device with you. 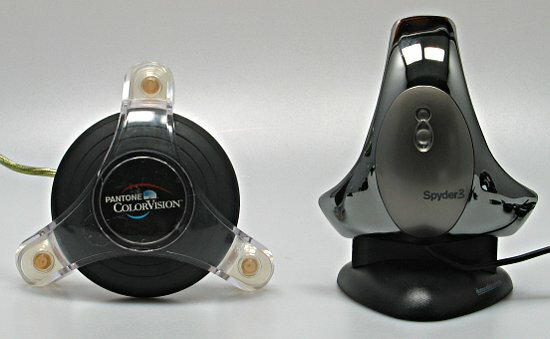 Here you can see the Spyder3 next to our ancient ColorVision Spyder unit. 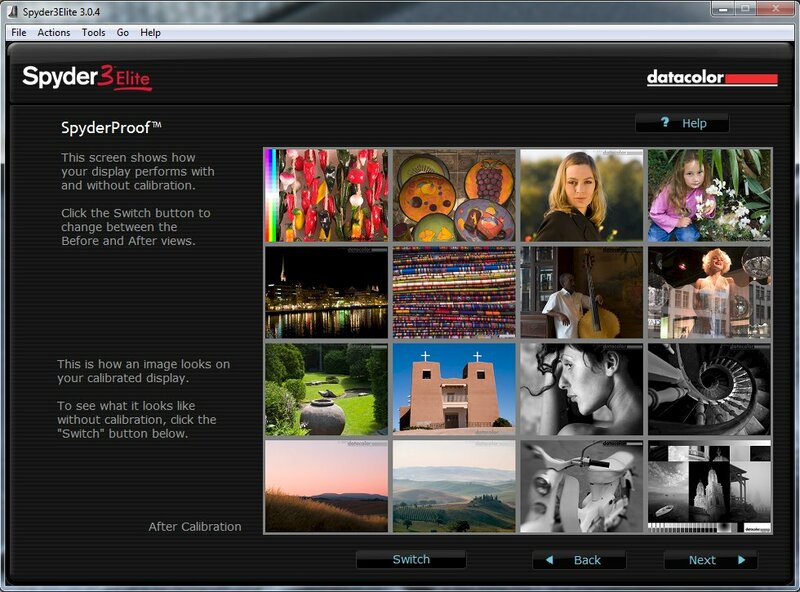 Installing Datacolor's Spyder3 software couldn't be easier. While they claim it's compatible with Windows Windows XP 32/64, Vista 32/64 (as well as Mac OSX 10.3 or higher), my Windows 7 Ultimate (64 bit) machine had no problem installing and using version 3.0.4 that was included on the Software CD. 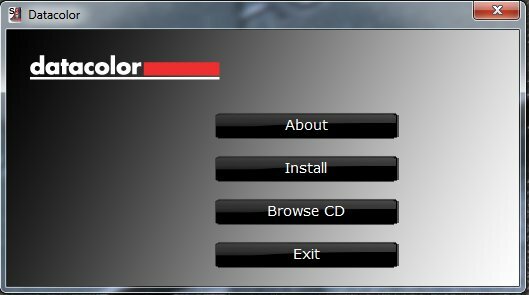 It took less than 5 minutes to install the Spyder3Utility software and the device drivers for the Spyder3 colorimeter. Once you've finished installing the utility (no restart required for me) and have entered your serial number, the application is now ready to use. When you first open the Spyder3Utility, it will open with the screen above, which shows the first display it has detected. From here you will follow several steps to indicate which monitor control options your display offers, which helps the software best determine what settings need to be calibrated. 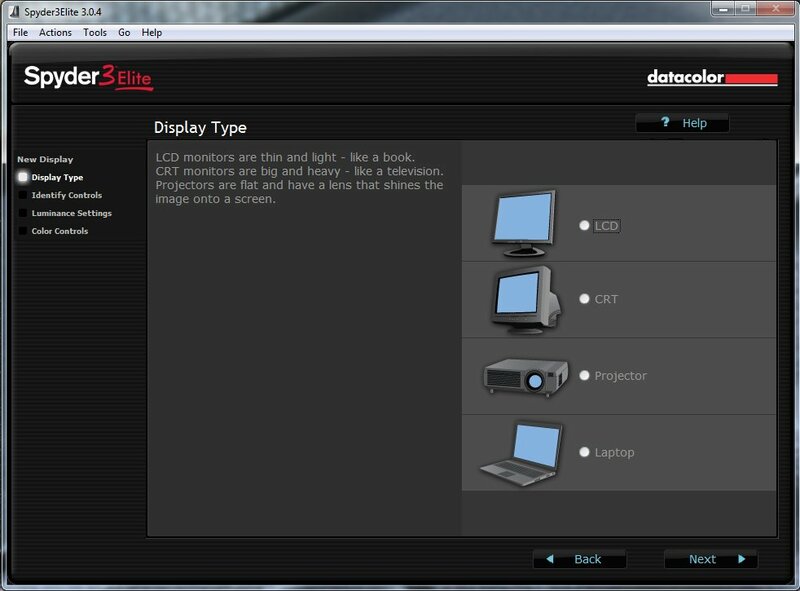 First you choose the display type: LCD, CRT, Projector, or Laptop. 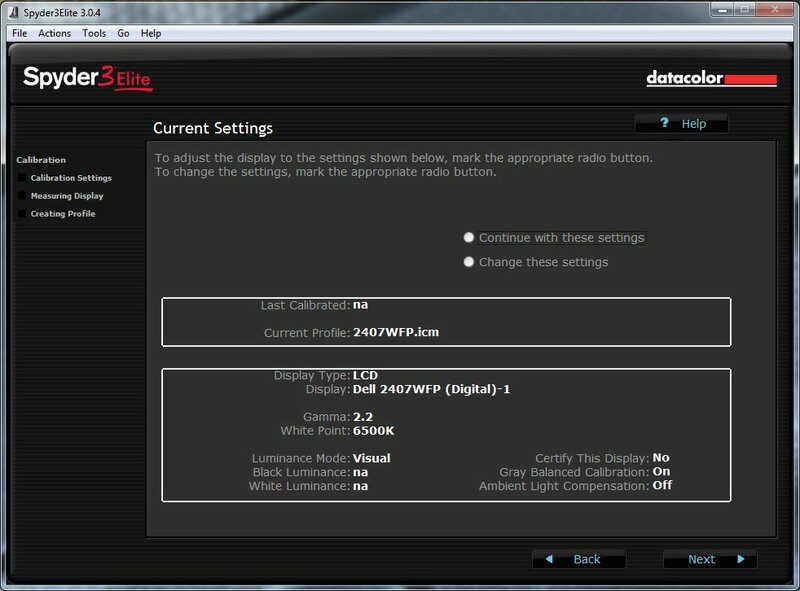 Next you tell the software what Brightness, Contrast and Backlight controls are available on your display. Depending on whether your display offers brightness or contrast adjustments, the utility will allow you to adjust your Black or White Luminance settings. It's recommended that you use the factory default settings for this option; which is what I did by resetting my monitor to factory defaults via the onscreen menu (not in Spyder3Utility software, but by pressing the menu button on my LCD monitor). 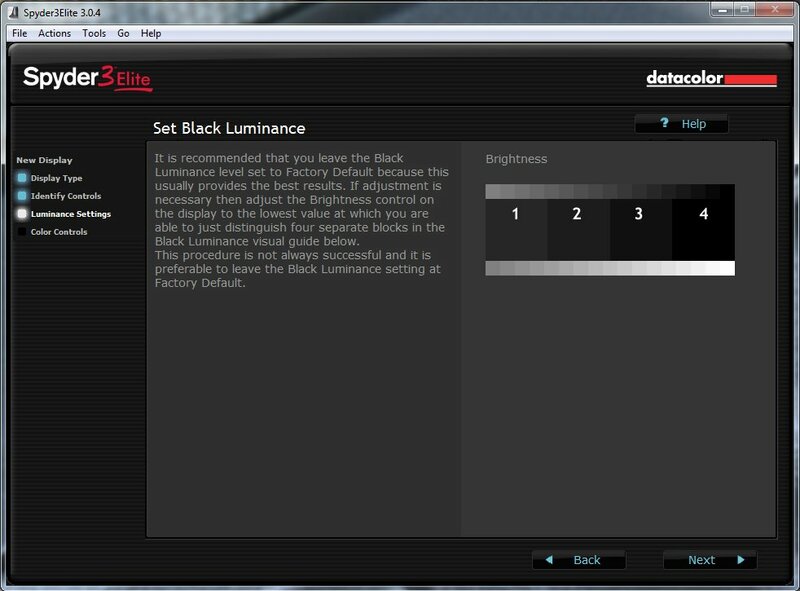 A small black or white luminance scale will be displayed on the right to help you dial in these settings using the controls on your monitor. Again, if you use the factory settings of your monitor, you should be able to easily distinguish between the different blocks on the scale. Next you need to indicate which Color control options are available on your monitor: Kelvin presets, Kelvin slider, or RGB sliders. 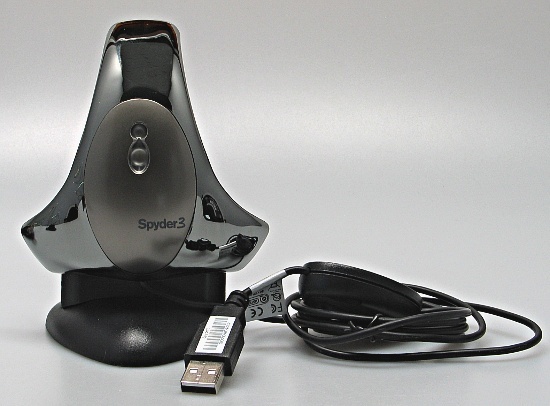 Lastly, you tell the software whether or not you plan on using the included suction cup to attach the Spyder3 device to your monitor, or if you will use the included counter weight and hang the device by the USB cord; the latter is the method I used. 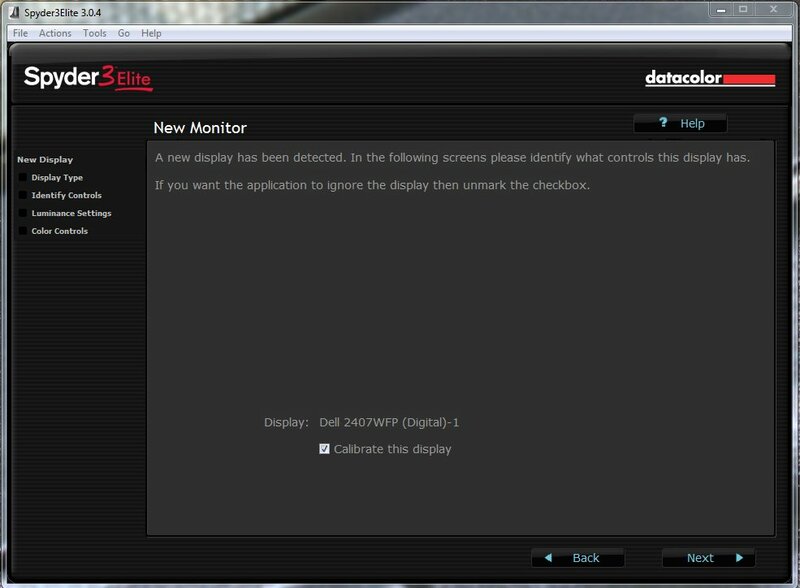 Now if you're like me and have more than one monitor, the software will indicate it's detected another display, and you will then follow the steps above for that device as well. All in all this took very little time, maybe a total of 10-15 minutes for both monitors combined. 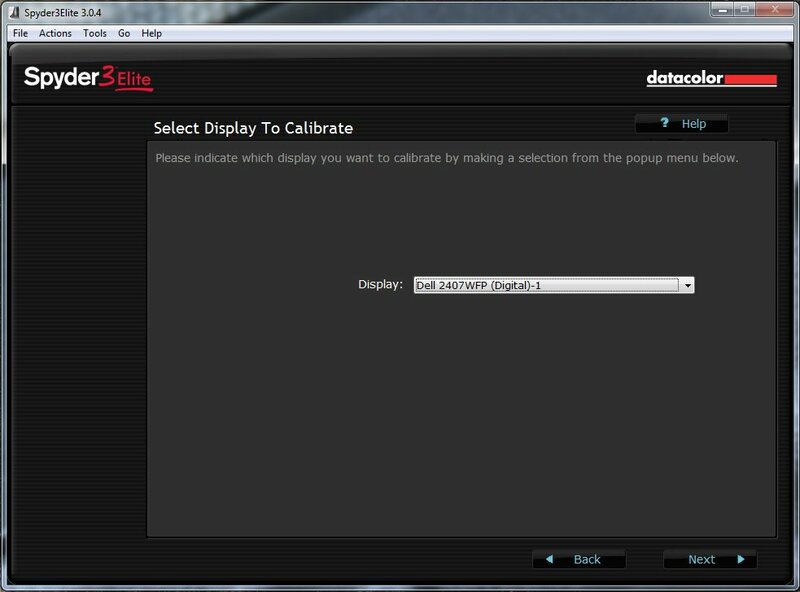 Once you've setup the Spyder3Utility software, now it's time to calibrate your display(s). Above you will see the initial screen, which allows you to select which display you want to calibrate; if you have more than one, simply use the drop-box to choose which unit you want to calibrate. 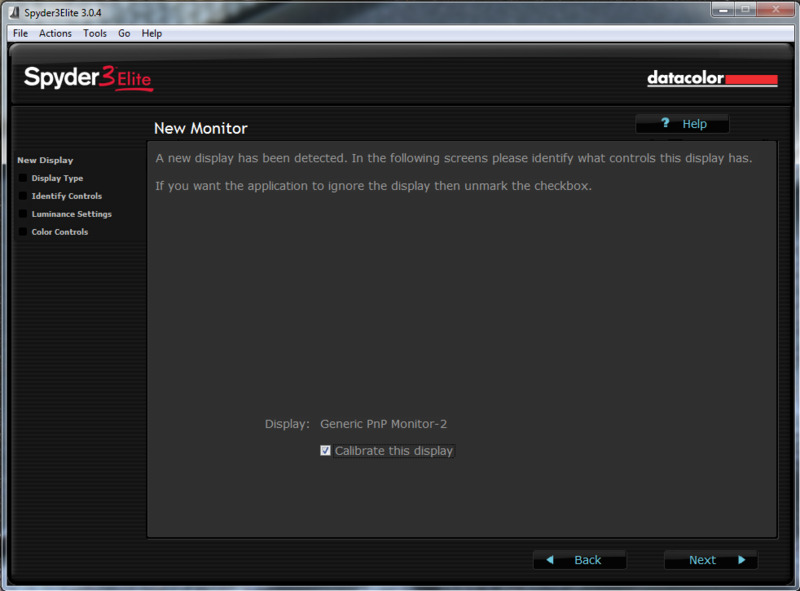 Next you need to verify your monitor's settings (which you selected during the initial setup). 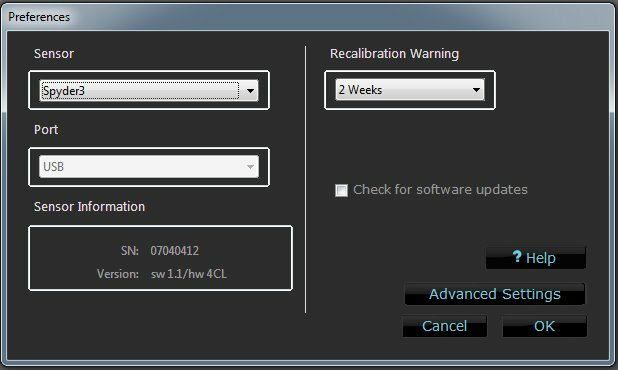 If needed, you can change these setting before starting the calibration process. Here you choose which Sensor (Spyder3 colorimeter) and Port (USB) are used as well as the Recalibration Warning interval (2 weeks is the default setting). 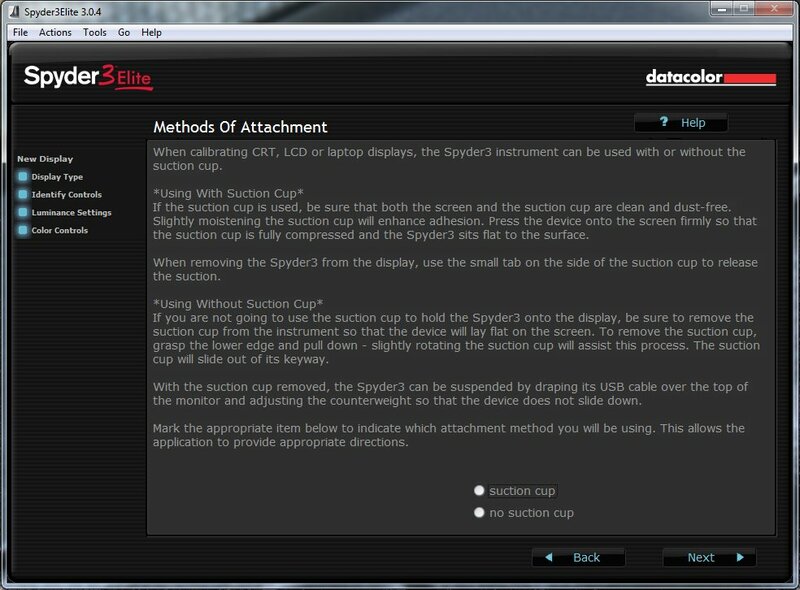 Now you need to align your Spyder3 device with the picture shown on the screen. From here, you press continue and the software will now run through the calibration. You will see different shades of red, green, blue, black, gray and white being displayed on the screen, which the Spyder3 colorimeter analyzes to ensure colors are displaying properly. It took only 4 minutes and 55 seconds for this process to finish; which is much faster than units I've used in the past. 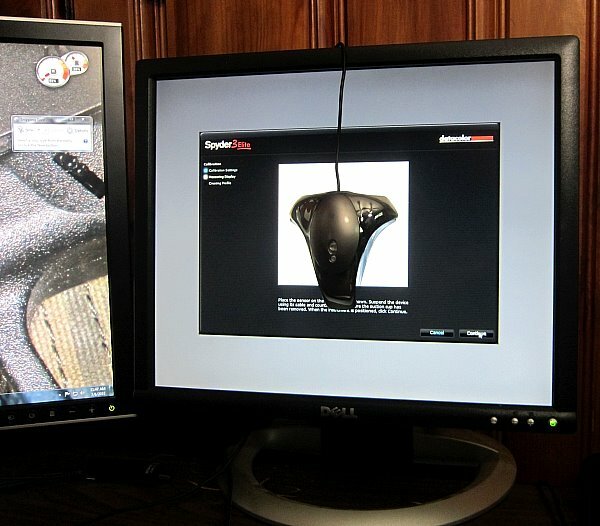 Here you can see the Spyder3 device being used on my secondary monitor. 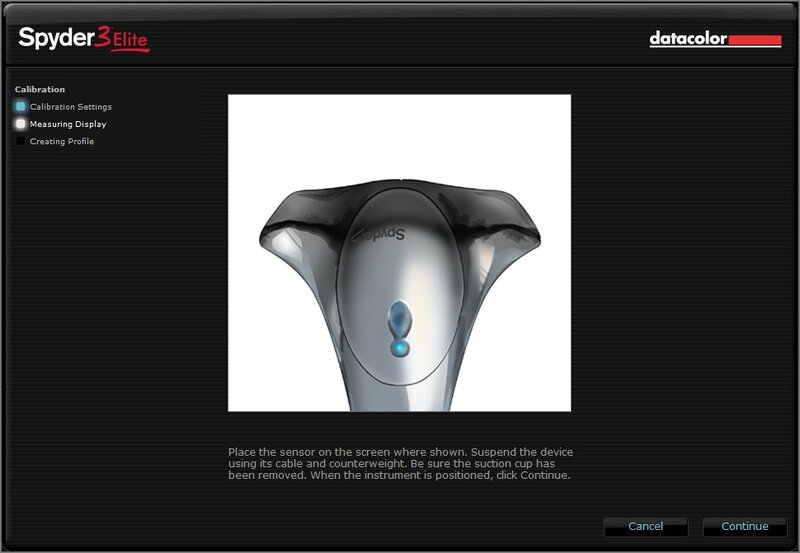 Once the calibration has completed, you are prompted with the screen above, which allows you to alter the name of the color profile you've just created. Next you are able to compare your previous settings with the new ones that have just been setup using your Spyder3. If you're like me, you'll see a Huge improvement in color, brightness and contrast when compared with the factory defaults of your display. "Congratulations! 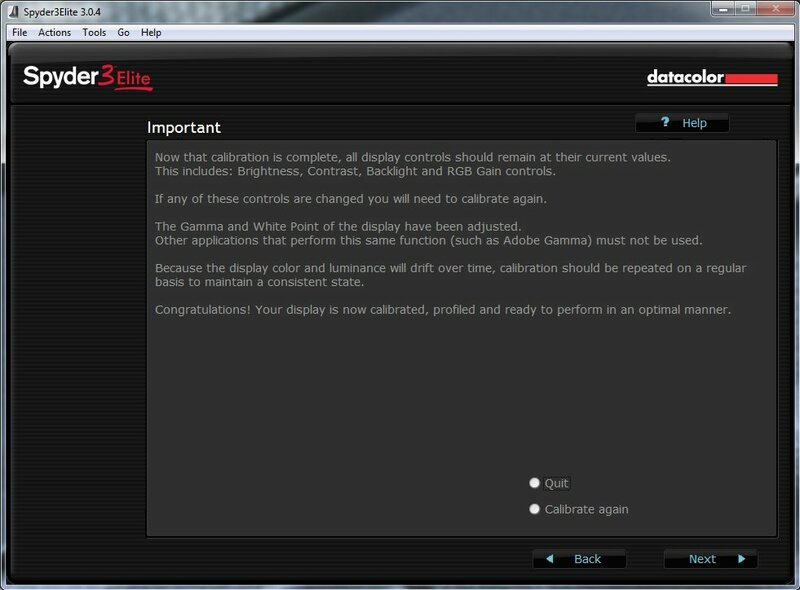 Your display is now calibrated, profiled and ready to perform in an optimal manner". This is message you'll see on the final screen in the calibration process (if you have a single monitor), which also gives you a few important notes. You can choose to Quit (close) the software, or calibrate one of your displays again (this option is only really needed if you have two or more displays). Now you are ready to view and edit your photos and videos with more accurate colors! 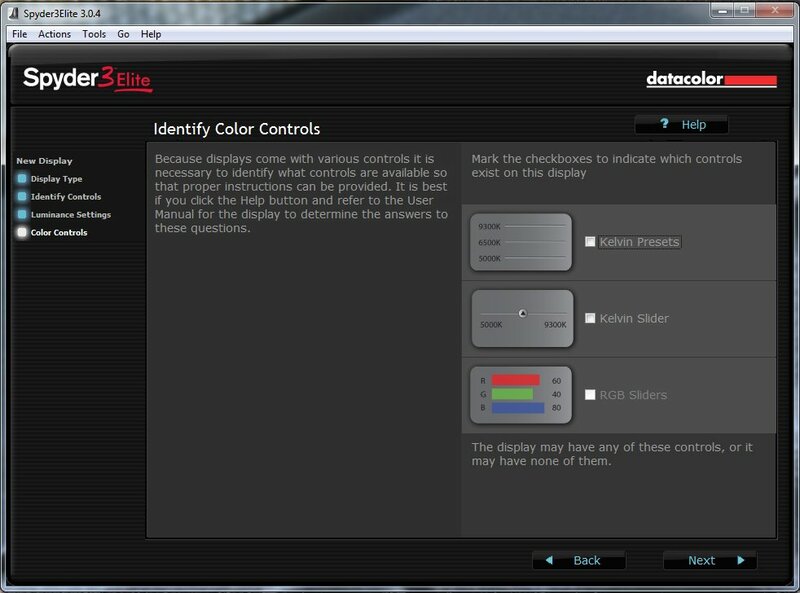 Datacolor's latest Sypder calibration unit is in one word, awesome. This is their best unit yet, which is smaller, more accurate, and faster than its predecessors. It's simple enough for anyone to use and thanks to the step-by-step instructions and Help options, even those who consider themselves computer illiterate should have no real problems getting the Spyder3 setup. The unit performed beyond my expectations, and their estimates on calibration times were spot on (they claim 5 minutes for the initial calibration, and it took us about 4 minutes and 55 seconds). One area that I personally have struggled with in the past is color reproduction when using dual monitors on my work PC. While both monitors are from the same manufacturer (Dell), each has a completely different color profile. Using the Spyder3 on both displays allowed me to see the same color profile on each monitor which is a huge help to me as I normally use one display for viewing photos and videos, and another for writing about them. With different color profiles I had to be Very careful to always use the same display for examining photos. However, this is no longer the case thanks to the Spyder3Eilte system. Now both LCD displays look almost identical.